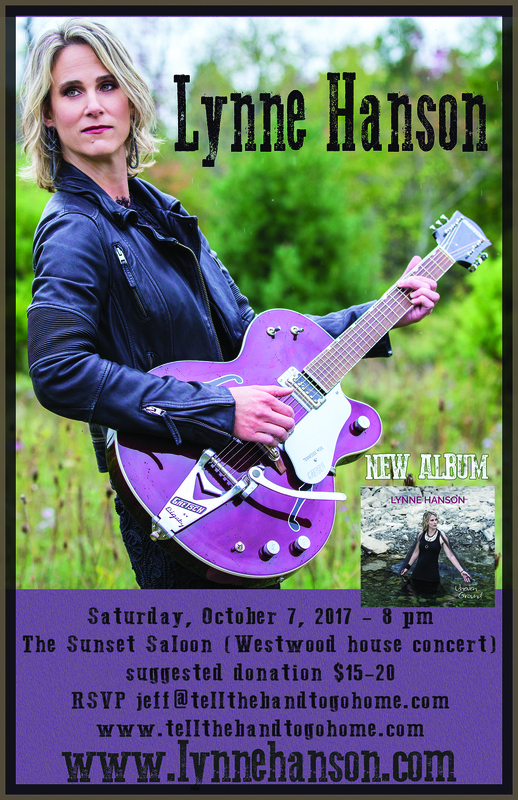 Home→Blog→Concerts→Lynne Hanson at The Sunset Saloon, Saturday, October 7, 2017! The Sunset Saloon is a house concert venue in Westwood (near the YMCA on Portage.) We’re open to all. Feel free to pass along the event info, bring friends, bring your kids (our kids will thank you), or just come by yourself and make some new friends! Admission is by donation, which goes directly to the artists. Most folks pay $20, but any hard working musician wouldn’t turn down more, and will take whatever is comfortable for you to give. In her brand new release Uneven Ground (April 2017), produced by Winnipeg’s Scott Nolan, Hanson explores the realm of giving sound advice through songwriting, and fighting back against the devil within us. Permeating the recording is a restrained intensity, elevated with a finger picked beat, beautiful piano accompaniments, dobro and wind instruments. The album leads out with the lush electricity of “Carry Me Home,” winding into down-home roots ballads like “Stronger” and “Just For Now”. The title track “Uneven Ground” is a full-on blues assault, conjuring images a glamorous chanteuse stretched out in front of a baby grand in a smoky nightclub. “Counting Heartbeats” and “Every Honest Misstep” each have a unique, driving, rain-on-the-windshield quality; with a pace that leans in on the gas just a bit. Altogether, Uneven Ground is an authentic expression of Hanson’s rustic style, brimming over with imagery and cleverly penned lyrics, and a crystal clear production. It steps proudly into the next generation of roots and blues music, while still respecting traditions. Growing up in Ottawa, Canada, Hanson started playing guitar as a teenager, eventually working her way to her award-winning debut, Things I Miss in 2006. Two more albums quickly followed, Eleven Months (2008) and Once the Sun Goes Down (2010). Each new release garnered critical praise, earning Hanson a Canadian Folk Music Award nomination in 2009, an invitation to the Kerrville Folk Festival, and the prestigious Colleen Peterson Songwriting Award, administered by the Ontario Arts Council. After a few years hiatus, Lynne Hanson returned with a new approach to songwriting, releasing her fourth studio album River of Sand in 2014 with producer Lynn Miles; a JUNO-award winning artist in her own career. River of Sand stands out as the creative output of the personal journey endured over her four-year break, and saw her writing mature into a more intuitive and visceral style. Lynne Hanson has toured across Canada, the US, Europe and the UK, either solo or with her band The Good Intentions. She’s showcased in Austin, Phoenix, and Memphis, toured in support of Grammy nominated artist Gretchen Peters and Steve Forbert, and performed at the legendary 100 Club in London England and the Bluebird Cafe in Nashville to name a few. She continues to tour throughout her established areas and expand into new realms with tours across Canada and Europe planned for 2017. We are very pleased to welcome Lynne for her first visit to the Sunset Saloon. We truly hope you’ll join us for a wonderful evening of songs and stories!